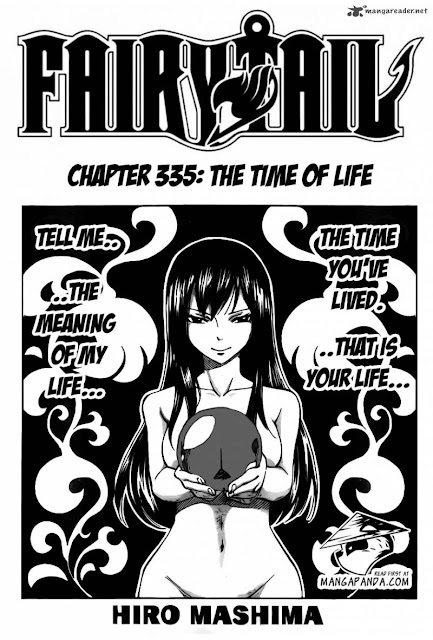 Otaku Nuts: Fairy Tail Chapter 335 Review - Let's Do The Time Warp Again! Fairy Tail Chapter 335 Review - Let's Do The Time Warp Again! A Massacre That Lasted Only One Minute. So to start off today's chapter, we got an extremely horrific page. It featured three deaths of beloved characters, known to fans as Bacchus of Quatro Cerberus (or Quatro Puppy as Elfman made them call it), Droy of the Levy's Team Shadow Gear in Fairy Tail, and Macao who is the father of Romeo and was once the Guild-master of Fairy Tail. There is blood everywhere and people are heartbroken as many fall because of these dragons and their minions. How Could Anyone Defeat These Three? For those expecting to see Juvia go nuts in this chapter, sorry but there was nobody around for her to go nuts on. Lyon dispatched those killers before we all got a chance to see Juvia go batshit crazy. Seeing Lyon and Juvia cry so much, yet not bawl and wail was, in my opinion, a really nice touch as it didn't make it seem too silly or ridiculous. Sadly, this is when we have to return to see Ultear letting out buckets of angst and self-hatred, hating herself for considering to kill Rogue to stop F.Rogue. As I said last time, I think she's being a bit harsh on herself as it is a war and people don't ever think clearly in a war, and murder is easily one of the biggest thoughts in a war. 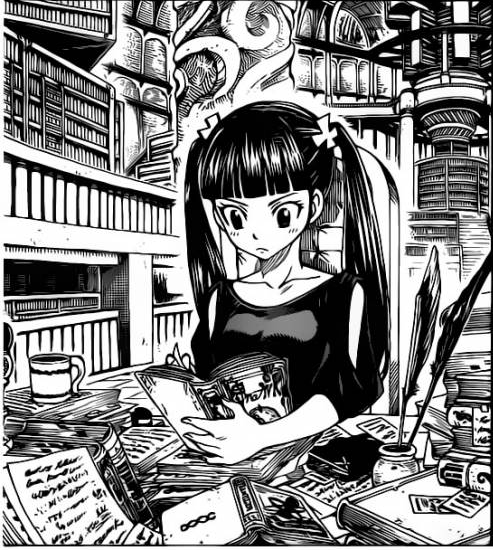 We now get a flashback for her, when she was a teenager and studying the Time Ark magic. It turns out that she had learnt many other types of magic including one known as Last Ages. 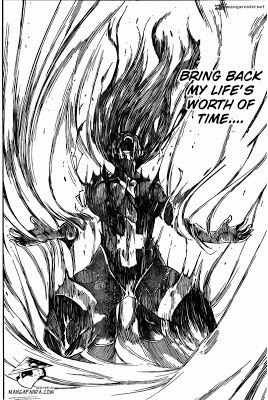 To put it simply, Ultear believed this magic could give her exactly what she wanted, to reverse time so she could be with her mother, but then Hades appears and tells her it would reverse time but it would also... kill her! (cue dramatic music). 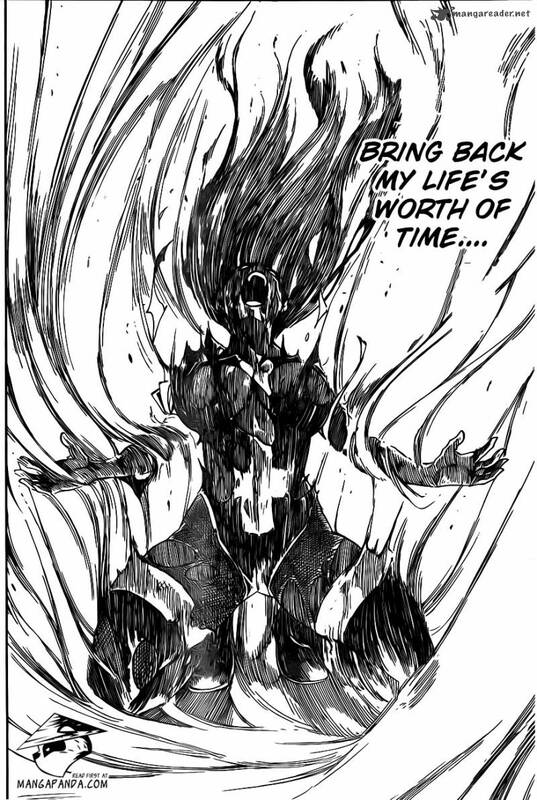 Ultear is okay with death now, as she seems to have gotten so depressed at herself that she decides it's time to go. She looks at the clock and activates the magic with the intention of reversing it to just before the Eclipse Gate was opened and all the dragons appeared. Thankfully, it doesn't work like that and the past 8 chapters don't become pointless and reversed. In fact, she reversed it by one minute! 60 seconds, and Ultear dies for that. 8th Gate: Gate Of Death Open! Now of course, we all think that it's a waste of time, since one minute isn't much. However, when you properly think about it, that's quite a lot of time. Especially if you think about how it's only been an hour since the dragons were released. 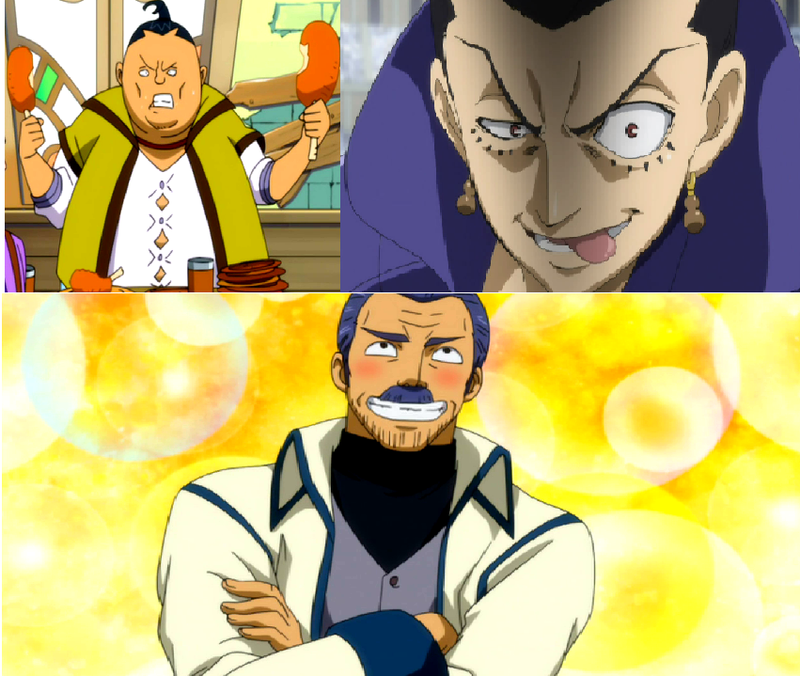 Everybody who died in the past minute, including Gray, Bacchus, Droy and Macao, is now back. Then something weird happens. Everybody can still remember that minute. It's unusual but they can all see how they died and how they reacted to that minute. This is quite strange but it's also the start of a counterattack, as they know what will happen and can react accordingly, such as Lyon and Gray setting up a shield before the dragons can blast Gray in the heart and head. 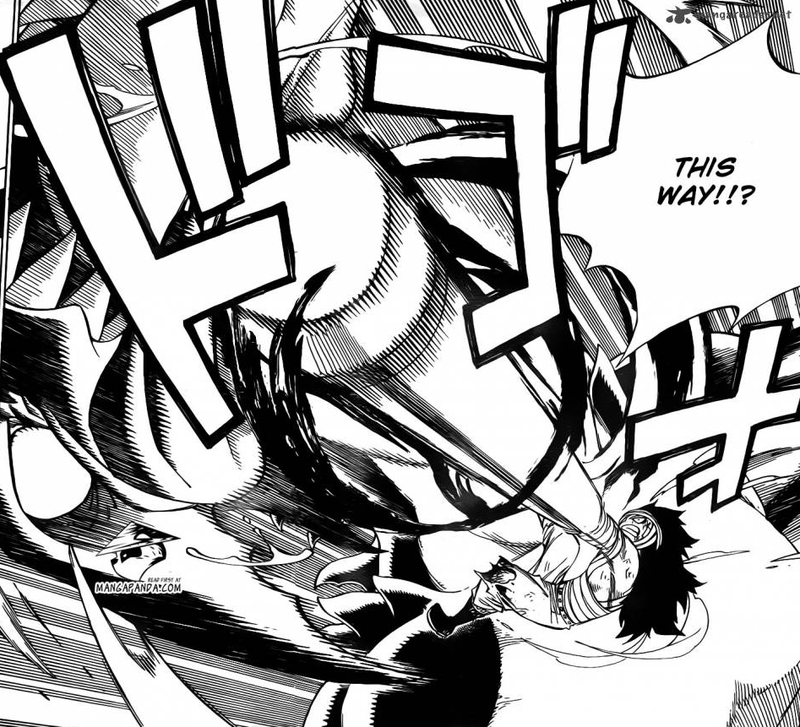 Gajeel's Reaction Is Hard To See, But He Decided To Punch It In The Face. My biggest problem about this arc is how much angst we got from Ultear, although it looks like we'll never see that again as she seems to have basically burned herself to death for those 60 seconds. Although to see the return of Gray, followed by the Dragon Slayers retaliation to their dragons, was a sight we should all enjoy. Now of course, there are some out there who will complain about the fact that the death count has gone down to only Ultear but I'd just like to tell you, it was obvious and it should be that way. Gray's death was nowhere near deserving of how it should have been, as it should be with his last words going out to Natsu or Juvia, and not in that annoying way where he doesn't get to finish his sentence. Overall Character of the Week: Gajeel Redfox for finally having an awesome but confusing page in which he punches a dragon in the face, and didn't waste any time giving us angst. Predictions: Gray will hopefully tell Juvia what he was about to say, and like I said, it'll probably be something silly and unexpected. I think that we might see more of the Dragon Slayers now, and how they take finally counterattack against the dragons, which is what I'm looking forward to the most. 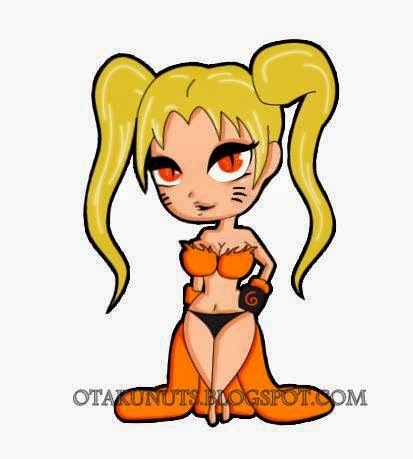 Natsu vs F.Rogue will probably take a while to end and we'll see everybody else win first. P.S I've been meaning to show more of these covers for each chapter and comment on them, so I think I will from now on. Hope you enjoy. Nothing Better Than A Transparent Ball To Cover Up Your Naughty Bits.